A very lucky dog had a very enviable experience recently while out enjoying a day at Whangaumu Bay in northern New Zealand. 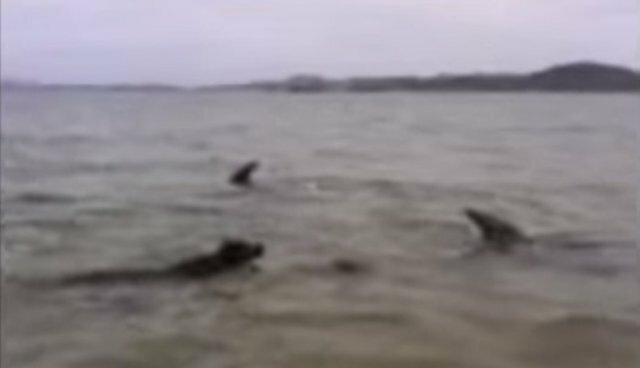 While the playful 10-month-old pup, named Jackie, sloshed around in the waves, she was met by a group of sea-faring locals - a friendly pod of wild dolphins - who seemed quite interested in making her acquaintance. According to Jackie's owner, Arriane Christie, the incredibly amicable interaction lasted more than 30 minutes, a few of which she was able to capture on film. Jackie is hardly the first dog to have found a friend in dolphins. In fact, there have been a number of similar encounters recorded on camera before. But perhaps the most memorable, and long-lasting, of these interspecies friendships is one made famous in a clip from the BBC show "Countryfile," in which a dog named Ben becomes best buds with a dolphin named Dougie in a harbor in Ireland.